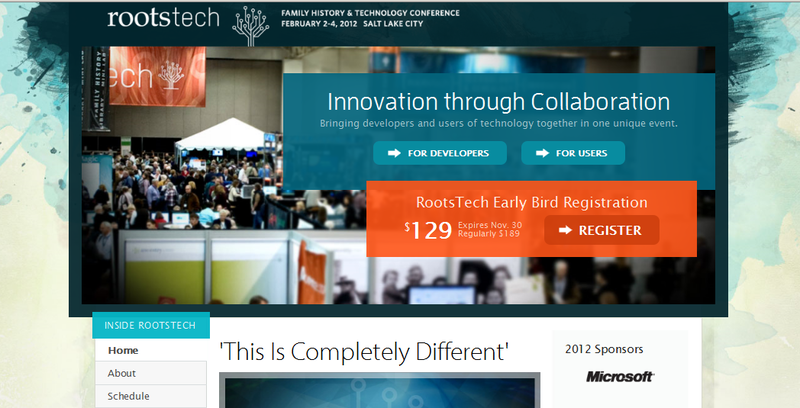 Genealogy bloggers got a preview of the new RootsTech.org site last night at a FamilySearch blogger gala held on the 29th floor of the Hilton Springfield (one of the 2011 FGS Conference hotels.) As promised the site has gone live today. I checked earlier and it wasn't working, but now, all systems are go! As a masterful approach to marketing, the all-important code will be given out tomorrow at the RootsTech booth in the FGS Conference exhibit hall, but it must be used prior to Saturday night, midnight. Once I receive the code, I'll then Facebook and Twitter the code to save my DearREADERS an additional $30. Note that I most likely won't get to my computer until much later in the evening tomorrow to blog the code to you. Right now, Ol' Myrt here has got to quit blogging and get to another FGS Conference event -- the FGS Luncheon with Ransome Love speaking. Looking forward to seeing just how much the Rootstech 2012 outstrips the 2011. It was exciting in the initial run so the powers to be will have to go a long way to exceed 201l. I'll be watching for that code to Register Mr Geniaus. Thanks for sharing.